So I'm on a drive to get my business jumpstarted. I've really been dilly-dallying for too long. Among the things I want to finish by the first week of August are the website and the designs and product list for ready-made products to be sold online and at craft fairs. I also need to send in (TODAY!) the last bits of paperwork to set Joie Studio up as a business. My goal is to hit the ground running by the end of August with products online to sell, a small line of customizable wedding invitations and announcements, and a game plan to take me through the upcoming holiday season. 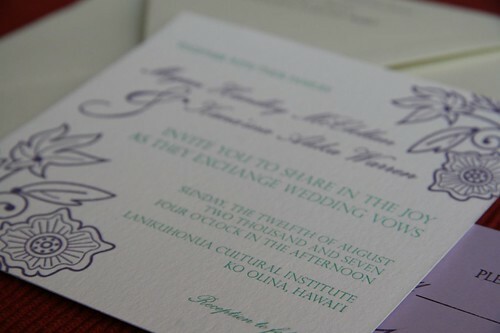 Definitely one of the things I want to highlight and promote are wedding packages that include both letterpressed invitations and a wedding website. Some of the things I'm pondering right now is how exactly I should set up my online shop and how many customizable products I should have, if any. I'm also wondering what kind of promotion I should do to get the word out and if I should go to any local craft fairs to not only sell my wares, but advertise my custom work as well! Please feel free to comment on what items you would like to see me sell, any business advice, and any craft shows in the LA area that you absolutely think I need to be at to sell my letterpress paper goods! Your blog has been so helpful to me. Because of this blog and your helpful examples I have finally decided to take the plunge and buy a press of my very own. I was wondering do you cut your paper or do you have it cut for you? If you do your own, what do you use to cut it? Thanks! First off, thank you for the feedback, and I'm glad that you find my blog so helpful! 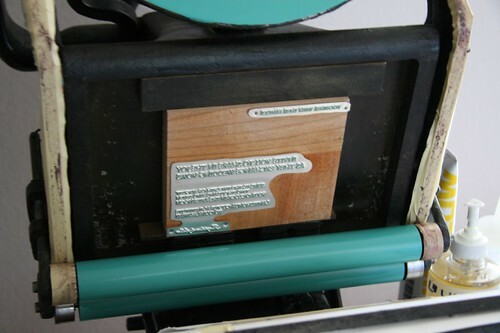 I do hope you find a class or a workshop near you so you get some instruction on letterpress before plunging in! On to paper cutting. So this is not quite as simple of an answer as you would think. I try to take the lazy approach and buy pre-cut paper and cardstock, like the Fabriano, Arturo, and Paper Source cards. But every now and then, it's necessary to get the paper cut down to size. When it's a professional job that I want to have exact cuts on, I take it to a professional place. Kelly Paper charges a flat charge of $15 to cut parent sheets down to whatever size(s) you want. But that means you have to buy the paper from Kelly Paper. Kinko's charges $1.49 or something per cut per 100 sheets, and so far, they've been the best and cheapest to work with. But every Kinko's is different, so tread carefully. Do a test cut order first. It'll be worth the $5 to make sure that they can actually cut and follow directions. I had half of a ream of 220lb cardstock ruined by Office Max's Impress, and I guarantee I will NEVER be going back there to cut paper. For smaller cutting jobs or jobs where I don't need exact precision, I use my 12" x 12" paper trimmer, which is a guillotine style trimmer. For the larger sheets, I go to Kinko's, where they have a large rotary trimmer set out for customers to use, or to my local art center/school, where they generally have larger paper trimmers set out for students to use. Here is my latest wedding invitation project! It's still in pre-approval stages, but I just thought you might want to see what I'm currently working on. 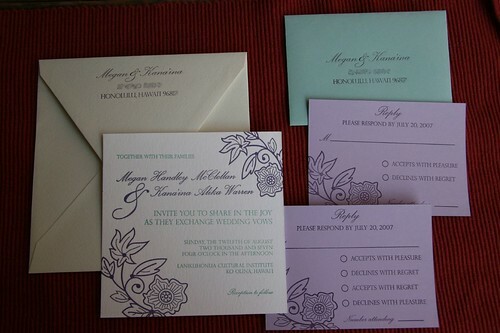 The bride decided on a lovely sage colored square enclosure card to work with. I'll keep you updated as I work on this further! 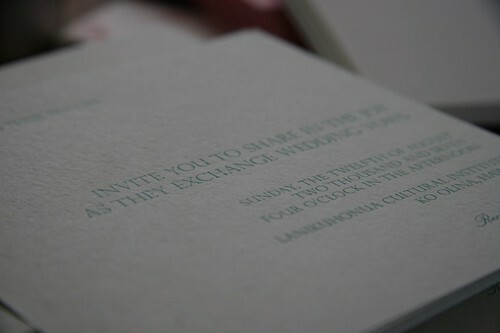 Okay, so I told you awhile ago that I would blog on the process of making my first set of wedding invitations. The design was based on my good friend's wedding dress, which you can find on the previous blog post about it. We had previously chosen two Pantone swatches to use, but when I mixed the original Pantone color we decided on, I found it too blue for the design's color scheme. So I mixed it to PMS #3268. 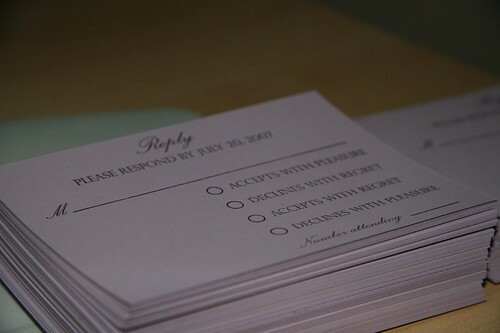 We got the invitation back in the mail last week all completely assembled. I haven't had a chance to take pictures with everything going on here, so definitely stay tuned for those pics. Also, I'm helping my friends Katie and Brandon out with their invitations, so I'll be sure to take more pictures as I do those! My computer is brain dead. The customer support has determined that my hard drive has "failed." Which means it's dead. Along with it goes the new website (some of it) that I had been building, my upcoming designs (all of it), my accounting books, my digital photographs, among other things. I'm pondering data recovery and how much that will cost. I should have used the back up drive that I have more often (like nightly). Sigh. At least all my letterpress pictures are up on flickr. And all of my potential clients' emails are on Gmail. Potential clients waiting to see the new designs, please pardon the inconvenience while I curse Dell for selling faulty products. I will get designs to you as soon as I can. At least their warranty service is pretty good.